Cape Town: A packed salesroom punctuated by enthusiastic applause acknowledged the fierce rivalry among collectors for top paintings, unseen in decades, at Strauss & Co’s red-letter autumn sale. The sale culminated in a record-breaking tally of R106 million in sales at a value sell-through rate of 93%. This performance is unrivalled in the marketplace. 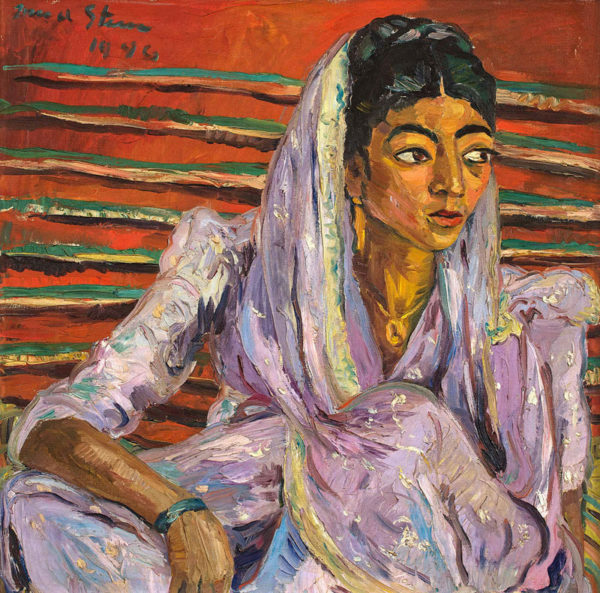 Irma Stern cemented her status as the most sought-after South African artist at auction when three paintings from her celebrated Zanzibar period (1939–45) sold for a combined value of R52 million. 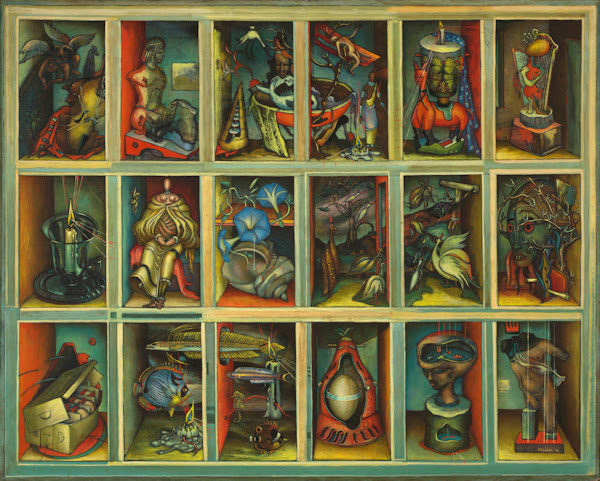 Adding to the buoyant mood was the sale of Alexis Preller’s seminal cabinet painting Collected Images (Orchestration of Themes) for just over R10 million, a new South African record. The top-selling lot at Strauss & Co’s sale was a previously unrecorded Stern portrait of an Omani nobleman from the court of the Sultanate of Zanzibar. 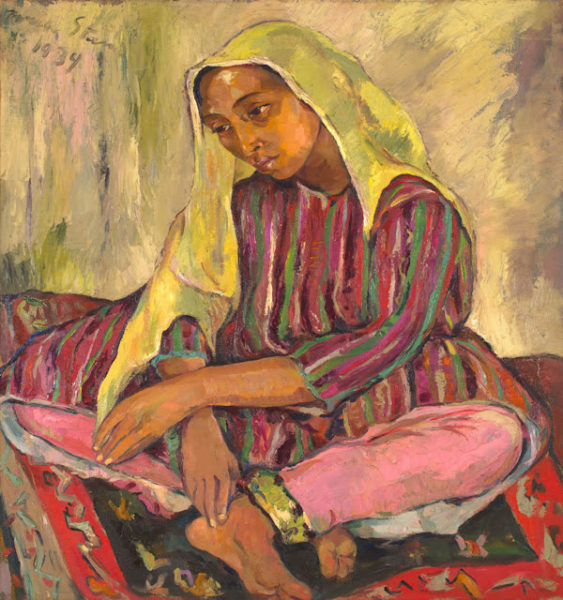 Painted during Stern’s second visit to Zanzibar in 1945 and acquired directly from the artist by the late collector Sol Munitz, Stern’s painting Arab sold to a telephone bidder for R20 484 000. The Munitz Collection consigned 15 lots to the sale, including Stern’s The Mauve Sari from 1946, which sold for R14 794 000, and Gerard Sekoto’s Saturday Afternoon, a bucolic street scene from his esteemed Eastwood period, which sold for R3 072 600. Paintings consigned from the Shill Collection also achieved outstanding prices. They included the world-record Preller work, as well as Stern’s 1939 portrait of a young woman wearing a yellow headscarf, Meditation, Zanzibar, which sold for R17 070 000 attracting the attention of a first-time Stern buyer. Also from the Shill Collection, Gwelo Goodman’s Interior Looking Out, Stellenrust sold for R216 220 and a small bronze of a bull by sculptor Sydney Kumalo achieved R421 060. The sale also included two important collections of decorative arts, notably a fine selection of Chinese and Japanese ceramics and works art from the Dr J.R. and Mary Strong Collection. International bidders vied by telephone for the Chinese pieces. A celadon and beige jade two-handled vase with five-clawed dragon motifs from the late Qing dynasty sold R227 600. A robin’s egg blue-glazed vase trounced the pre-sale estimate, achieving R136 560, while a pale celadon jade brush washer fetched R96 730. There was also considerable interest in the Strong Collection’s carved pieces. A trio of Chinese snuff bottles, including a pink tourmaline example depicting a qilin (mythological hoofed creature), sold for R54 624. A nineteenth-century wood netsuke depicting a seated tiger achieved R34 140, the top price for a netsuke. Visiting British auctioneer and art specialist Dendy Easton handled the premier evening session at Strauss & Co’s pacesetting sale, which noticeably bucked a recent trend of sluggish bidding. Buyer appetite for quality works was immediately evident when Easton opened the session with two impressive oils by Gwelo Goodman. Both works achieved solid prices: a historic picture of the Old Town House in Cape Town sold for R546 240, while a landscape titled Full of Flushed Heat – Tulbagh sold for R512 100. JH Pierneef is Strauss & Co’s second-highest grossing artist and once again demonstrated his broad appeal. There was a palpable buzz in the salesroom when his 11 by 13,5cm casein, Golden Gate, came up for sale – the work eventually sold for R227 600. Extensive Landscape, an evening-coloured oil on board painted in 1926, sold for R398 300. An Extensive Mountain Landscape, formerly owned by the Scottish family Linney, achieved R 375 540. Post-war artists Peter Clarke, Erik Laubscher and Cecil Skotnes also drew strong bids. Painted in 1960, Clarke’s architectural landscape, Farm House, sold for R284 500. Icon, a tall carved, incised and painted wood panel by Skotnes from 1965, sold for R512 100. Laubscher’s mid-period Still Life with Jug, Bowl and Fruit from the 1960s confirmed his status at auction and sold for R910 400. Stern performed remarkably well across all categories of her work. 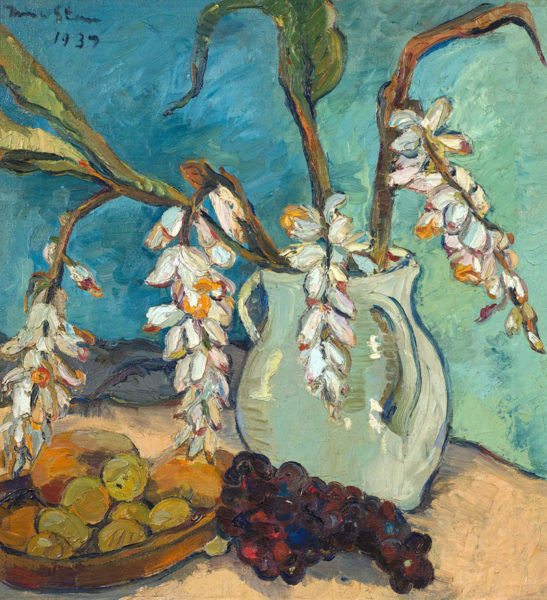 A 1937 work titled Still Life with Ginger Plant sold for R6 145 000. All six works consigned by the Irma Stern Trust Collection found buyers, including two gouaches, both titled Two Women, from 1953 and 1961, which fetched R153 630 and R142 250 respectively. Other notable sales included a strong performance by painters Judith Mason and Walter Meyer, both represented by four works apiece. Mason’s oil on board Horse was her best performing work, selling for R204 840, while Meyer’s sunburnt study of Smithfield in the Free State sold for R108 100. The daylong sale commenced with three sessions devoted to the decorative arts. A painted and glazed ceramic by Esias Bosch depicting a vase of indigenous flowers in a landscape, sold for R739 700, doubling the previous record achieved at Strauss & Co’s October 2018 sale. The decorative arts catalogue brought in a total of R10.6 million in sales, underscoring the importance of this discriminating collector category.